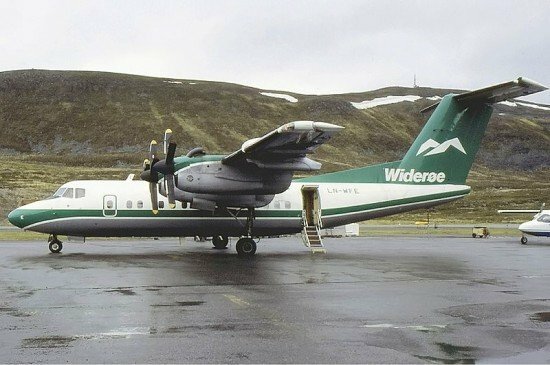 The Accident Investigation Board Norway announced that it will investigate new information relating to the accident of a Widerøes DHC-7 in 1988. On May 6, 1988, a Widerøes Flyveselskap de Havilland Canada DHC-7 airplane flew into rising terrain while on approach to Brønnøysund Airport (BNN), Norway. All 36 on board were killed. The crew executed a VOR/DME approach to Brønnøysund’s runway 04, and it would circle for landing on runway 22. The crew left the prescribed altitude 4 NM early. The aircraft descended until it flew into the Torghatten hillside at 560 feet. The investigators were not able to establish why the descent was iniatiated prematurely. Poor cockpit discline and CRM may have contributed, according the final report. A retired police officer now reported that a passenger had taken a mobile phone on board. The police officer disembarked the plane at Namsos, a stop-over and reported that the passenger with the mobile phone was seated in the cockpit’s jump-seat. After the accident, he reported this fact to the Joint Rescue Coordination Centre (JRCC). After reading the investigation report during the 25th anniversary of the accident, he noticed that there was no mention of the mobile phone. NMT 450 network-based mobiles at the time were fitted with a 15-watt transmitter and a powerful battery which could lead to disruption in electronic equipment. The AIB will now investigate if electronic interference from the mobile phone may have affected the flight instruments.